First detected in 2002, Fast Radio Bursts (FRBs) are quick, high-energy pulses originating from galaxies billions of light years away. Scientists still don’t know the true nature of these bursts or what’s causing them, but new observations of the only known repeating FRBs are providing details about the extreme environments in which these pulses are born. To date, astronomers have only documented a handful of FRBs; their fleeting, unpredictable appearances make observations difficult. A few years ago, however, scientists detected the only known source of repeating FRBs, an object dubbed FRB 121102. A new paper published today in Nature is now the first to provide a description of the environment in which this source is located. We still don’t know the nature of the source or cause of this repeating FRB, but the detection of an immensely powerful magnetic field in its vicinity suggests some tantalising possibilities. 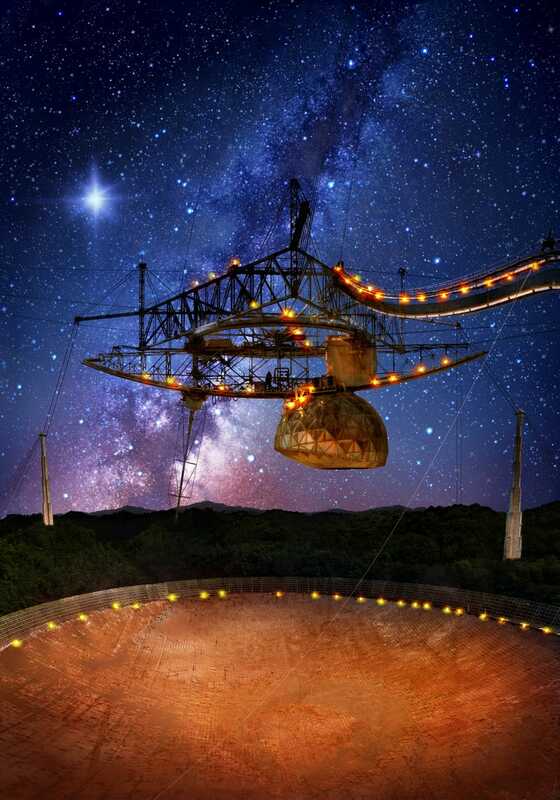 Using the Arecibo Telescope in Puerto Rico and the Green Bank Telescope in West Virginia, an international team of astronomers led by Jason Hessels from the University of Amsterdam detected and monitored 16 recent bursts from FRB 1211012, which is located three billion light years from Earth in a nebula (a star-forming region) within a dwarf galaxy. That’s an extreme distance, to say the least. Whatever’s causing these bursts must be releasing enormous amounts of energy with each pulse. Scientists estimate that there’s as much energy packed into a single millisecond of an FRB as our Sun releases over an entire day. Theories as to what’s causing FRBs include everything from magnetised neutron stars and supernovae through to super-massive black holes and the activities of extraterrestrial civilisations (yes, really). What these researchers found was that these bursts are highly polarised, exhibiting a very high and variable Faraday rotation measure. When polarised waves travel through an area with a magnetic field, the polarisation gets twisted by a phenomenon known as Faraday rotation. The stronger the magnetic field, the stronger the twisting. In the case of FRB 1211012, the twists are among the largest ever recorded in a radio source. This led the researchers to conclude that the pulses must be passing through an incredibly strong magnetic field in a dense plasma. Neutron stars are the remnants of ancient stars, between 10 to 29 times the size of our own Sun, that exploded in supernovae, where only the core remains. These stars aren’t capable of producing nuclear fusion reactions, so the absence of outward pressure causes the star to collapse in on itself, forming a small, super-dense orb. Neutron stars are so gravitationally heavy that they cause protons and electrons to combine into neutrons (hence their name). As for the possible source of the FRB, Petroff said it’s hard to say which scenario is responsible. Magnetars—a special type of neutron star with an extremely powerful magnetic field—are a leading candidate for the source of FRBs. Radio magnetars can produce the kind of highly polarised emissions seen in FRB 121102, so the new study doesn’t eliminate these objects as a candidate source. 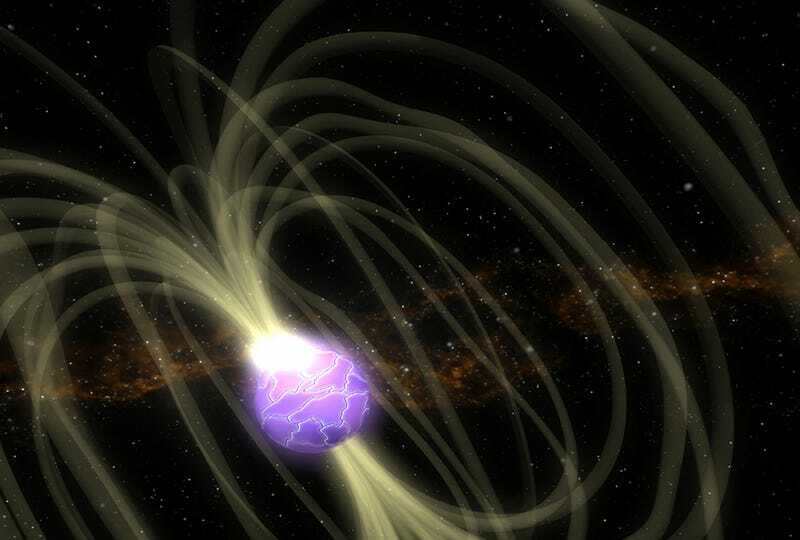 But if it is a magnetar, if would have to be located in “a very dense and extreme environment to produce all the observed properties of the FRB,” said Petroff. Astronomer Avi Loeb from Harvard-Smithsonian Centre for Astrophysics—also not involved with the new study—said the repetitive nature of FRB 121102 means it can’t be associated with a cataclysmic event, such as an explosion, a merger of compact objects, or the collapse of a star, as some astronomers have previously suggested. He said the new study, with its “inferred properties of the extreme magnetic environment,” doesn’t pinpoint a single source type, saying it could, for example, be accommodated by a young neutron star or the extreme conditions located at the centre of a galaxy, the latter of which he says is unlikely. In a previous paper, along with his postdoc, Anastasia Fialkov, Loeb estimated that, based on current data, there should be an FRB every second in the entire observable universe. “With improved sensitivity of future radio telescopes, such as CHIME or SKA, we should be able to get a better census of FRBs and decipher their origin,” he said. Petroff said it’s important to keep in mind that this particular FRB is special. Given that we do not understand the origin of FRBs, Loeb says we should keep an open mind and examine future data without a prejudice. He even says we should even entertain the possibility that some FRBs are associated with artificial radio beams produced by alien civilisations. What the Hell is Going on With This Comet?